Metal Gear Solid Twin Snakes has become a rare collectible in the matter of months. The game has always been a relatively expensive game as you can see from the chart below. Selling for about $20-25 used for most of last year. 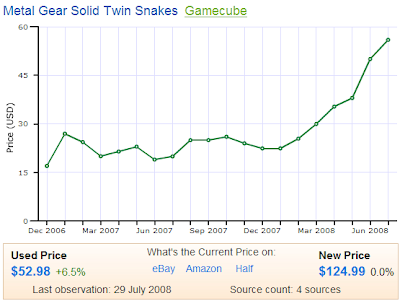 But in the last six months MGS Twin Snakes has increased in price every month and now sells for about $53 used and $124.99 NEW. What caused Twin Snakes to become such a collectible so fast and will it last? 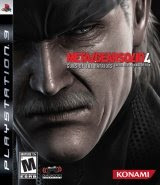 The release of Metal Gear Solid 4 probably helped ignite interest in the Metal Gear series again which increased demand. The game didn't sell very well so there aren't many copies available to meet this new demand. But the price increased nearly 150% from January 2008 to today. That is much bigger than previous sequel price increases we have seen like Grand Theft Auto and Pokemon. This price spike is more than a temporary increase because a new game comes out. I think collectors have decided for some reason that this is a game they want for their collections. This kind of increase will keep prices high for the foreseeable future. The game sells for $9 used and $130 new. The game sells for $170 used and $330 new. The game sells for $10 used and $99 new. The game sells for $5 used and $120 new. The game sells for $56 used and $96 new. The game sells for $32 used and $200 new. The game sells for $52 used and $130 new. The game sells for $7 used and $90 new. The game sells for $35 used and $120 new. The game sells for $8 used and $199 new. The game sells for $56 used and $179 new. The game sells for $9 used and $100 new. The Nintendo DS has seen more than 1,600 games since it launched in 2004 and became one of the best selling video game consoles of all time. 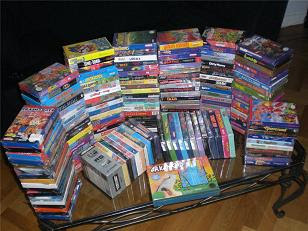 Quite a few of the thousands of games for the DS have become rare and some have become very expensive for collectors. Below is a list of the most expensive and rare Nintendo DS games. At E3 2004 Nintendo previewed Zelda Twilight Princess to all media at their press conference. They also made a Nintendo DS cartridge with the same Twilight Princess demo video and gave these away to all attendees. 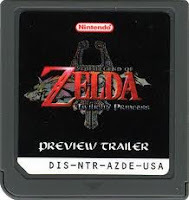 The cartridge contains no game play, just a short video of the game. There are probably around 500 of these games and some of these might have been destroyed by the media who received them. The game was never sold commercially or sealed so there are no new prices for the item. 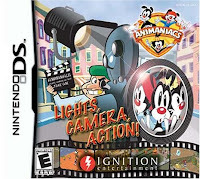 In Animaniacs: Lights, Camera, Action you try to create three movies by finding keys, hitting switches, and defeating enemies. During gameplay you can switch between one of five Animaniacs characters to take advantage of their strengths and weaknesses. The game was published by Ignition Entertainment in 2005. Ignition is a smaller publisher and generally makes smaller production runs for their games. The DS version of the game was universally panned by gaming critics. Play as Strawberry Shortcake and travel during every season of the year to try and collect ingredients for the largest cake of all time. 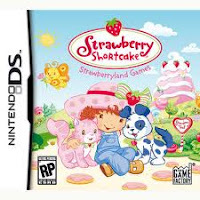 It was the last Strawberry Shortcake video game released for any console. The game is notoriously hard to find. It was published by American Game Factory in November 2007 and marketed only via the Strawberry Shortcake email newsletter. Due to the smaller publisher and almost non-existant marketing the game didn't sell many copies. 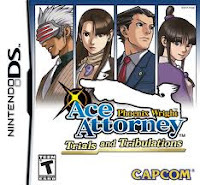 Phoenix Wright: Trials and Tribulations is the last game in the Phoenix wright series of games. You play as an attorney who must investigate crimes and defend his clients. It plays like a visual novel with puzzle and adventure twists. Reviews and sales for the game were very good and Capcom even issued an apology because it was so hard to find for a while. Capcom met initial demand, but after production ceased prices for the game have continued to increase. 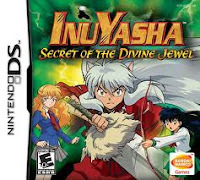 Inuyasha: Secret of the Divine Jewel is a turn based role playing game developed by Bandai. You play as InuYasha and her friends as you try to save a girl who is the target of demons. The game was released in 2007 and is the only InuYasha game developed solely for the US market and not released in Japan first. It is also the last InuYasha game relesaed for any console. Fans of the anime series help elevate prices for the game. 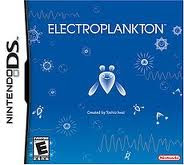 Electroplankton is a experimental music creation 'game' released by Nintendo. It doesn't have any end point or goals so some people prefer to call it a toy. You touch plankton on the screen and they make different sounds. You can combine the touches together to make music. 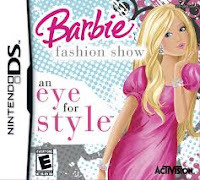 The game was initially shown at the Game Developer's Conference in 2005 as a showcase for what the DS could do. It wasn't released commercially until January 2006 and then only online and at the Nintendo World store in NYC. When the game sold out quickly resale prices were upwards of $70-80 in used condition. Prices have steadily declined over time though. Customize different dresses, shoes, fabrics, accessories, and more to create your own fashion line. You are given different design challenges like making the perfect outfit for a male or female at a dance or wedding. The game was published by Activision in 2008. Prices for the game increased dramatically during Christmas season 2010 selling for almost $50 in December 2010. Prices have stayed high ever since. 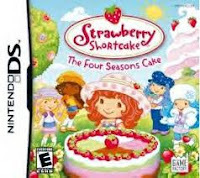 Another Strawberry Shortcake game developed by Game Factory this time it is a collection of mini-games themed after Strawberry Shortcake. The game was released in 2006. In 2009 the Strawberry Shortcake franchise was relaunched with a new movie, new toys, and new characters. The relaunch increased interest in the video games as well. 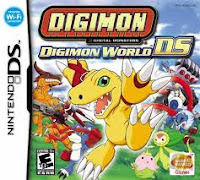 Digimon World is the first of four Digimon games to come out on the Nintendo DS. You tame, raise, and command Digimon and try to collect creatures during your adventure. A Digimon game seems to make an appearance on almost every console's most valuable list. The series continues to stay popular over a long period of time, which helps keep prices high. The Winx series of games and television shows tells the story of six teenage fairies who must defeat Valtor. The gameplay is part side-scroller and part mini-game collection. The game was released in October 2008, more than a year after the show stopped airing on TV and demand had dropped significantly by this point. In 2011 Nickelodeon aired four one-hour special features, which summarized the events in each season. 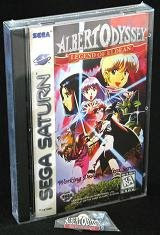 This added exposure helped increase prices for this rare game. 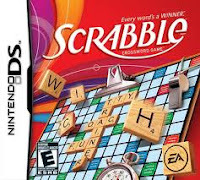 Scrabble was published by Electronic Arts in March 2009. It is a video game version of the popular word board game and includes six skill training games to help you improve at the game. Soon after the game was released, EA decided to focus the series on mobile devices like cell phones and tablets. EA stopped production of the DS game in 2010. This was around the same time overall interest in Scrabble increased due to the popularity of the game on other devices. This is the second Phoenix Wright game to make the list. Phoenix Wright: Justice for All is the second game in the series. It uses the same exact engine as the first game but adds new characters and brand new cases. 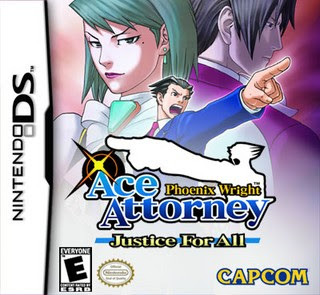 Capcom produced the game in limited quantities and unlike the original Ace Attorney game it was never reproduced. Just like Trials and Tribulations, Justice For All has increased in price steadily during the last two years. A card based Yu-Gi-Oh game for the Nintendo DS. You obtain playing cards in the game, Wi-Fi download, and trading. Then arrange your deck and fight virtual characters in the game or compete in a world ranking system online. World Championship 2008 was the last game based upon the GX anime series. All future Yu-Gi-Oh games for DS have been based on the 5d's anime series released in 2008. Used copies sell for a modest $15-18, but new versions sell for $60. Dinosaur King is a hybrid card battling game and Pokemon clone created by Sega. You find fossils during gameplay and convert them into cards so you can control the dinosaurs. Each dinosaur increases levels and learns new moves as it gains experience from battling. In 2008, the same year the game launched, trading cards and an anime series on Fox came out as well. The series stopped airing in 2010 and prices nearly doubled. The game has stayed valuable ever since. Smart Kid's Party Fun Pack is a collectiong of mini-games designed for little kids and based off the Smart Kids series. The game was published by UFO Interactive in 2008. All the Smart Kids Nintendo DS games continue to sell for a premium price, but Party Fun pack is the most expensive. Another series with two games in the most valuable list. 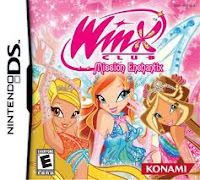 Winx Club: Quest for the Codex was the first game in the Winx series and released in 2006. Like Mission Enchantix, Quest for the Codex started increasing in price in 2010 and has continued to appreciate at a steady rate. Do you know the rare video games on all systems? The list is ranked by the highest average new price and then highest average used price in the event of a tie. This is the first in a series of articles highlighting rare game auctions on ebay. 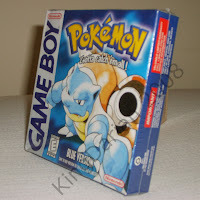 Unlike the other "sealed auctions" series, these games are opened but the games are rare collectibles and usually very hard to find. The game sells for $30 used and $117 new. The game sells for $75 used and $??? new (this is the first one we've seen). The game sells for $35 used and $84 new. The game sells for $45 used and $85 new. The game sells for $34 used and $41 new (prices for regular version, not limited edition). Limited edition only printed 1,000 copies. The game sells for $32 used and $64 new.